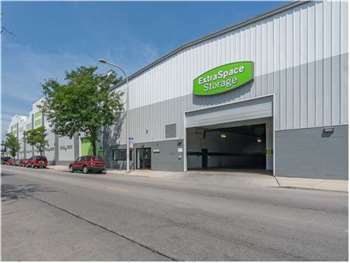 For residents of Old Irving Park and surrounding neighborhoods, including Irving Park, Portage Park, and Belmont Gardens, Extra Space Storage is about as convenient as self storage gets. You'll find us just west of the intersection of W. Addison St. and N. Milwaukee Ave. directly across Addison from The Bruss Company. Schurz High School and Kilbourn Park are two recognizable landmarks near this facility. Would you prefer to keep your belongings in ideal storage conditions year-round? Our climate-controlled storage units offer just that. With a consistent environment kept between 55°F and 85°F at all times, you won't have to worry about temperature-sensitive belongings in storage. With drive-up storage units available, our storage facility offers a safe place to store cars and motorcycles. These storage units provide a garage-like area to store your vehicle, protecting it from the elements throughout the year. With advanced security features like gated access, security cameras, individually alarmed storage units, and a resident manager, you can rest easy knowing that your belongings are well-protected. Our friendly, professional staff genuinely cares about your experience at our facility. We're here to help you however we can. This is an excellent storage facility. Have been storing for business and personal for last15 years. Bernadetta has been there the longest and is amazing when helping you with your needs. Lupe has been a short time but also follows suit in excellence and attentiveness. You cannot go wrong and can rest easy your items are stores with responsible folks. Definitely recommend. Unit is big, very clean, easy to access. There's a dolly/cart on site for renters to use to take stuff to and from the lockers. Lupe, the site manager, was very friendly and helpful for all our questions. The manager was very easy to work with. The price was probably right in the middle of the places we looked at. Good location, clean facility, easy in and out. The service is the best I have ever received. The storage unit was very clean and easy to access off hours. I loved my experience and highly recommend using ExtraSpace Storage. I have used this facility a number of times over the last few years for extended periods. The last time I needed to change to a smaller space and the staff was very diligent about updating me when spaces became available. I found exactly what I needed. I have never had an issue with rodents or bugs and my locker has never been disturbed. The staff is always helpful. The layout can be confusing though. I used to come in sometimes to pay my bill and miss Tara. The facility is clean, and I feel that my items are safe here. You can access your unit between 6 am and 10 pm which is very convenient. The price is right at $62/month for a 5x10 unit (special online price). The manager was very kind and helpful. Also we were told that the unit was 8 feet high but I think it's at least 9. A pleasant surprise as we could fit more than we thought! The only problem I've encountered is not being able to locate carts. Other than that its been a great experience! Want to thank Terry again for keeping the initial encounter very efficient. I was on my way out of town and he had me wrapped up in 30 minutes. And, he gave me a very clear understanding of how to get around when I return. The access at the facility is very good and that will help especially on visits in the future. Terry did a great job helping me select the perfect unit and walking me through the best move in process. I was very pleased with everything including the fact that I called at the last second and they still took care of me within an hour. Thanks Terry! Customer service is extremely friendly and attentive here. The set-up of the facility is easy to navigate and effective for loading/unloading. I get the feeling that any possible issues are covered and foreseen well before they happen (including an issue with my online billing that did come into effect, and was solved quickly). No problems. Reasonable rates. Good employees. Clean. Temperature stable. Thanks. This facility has great, friendly and very helpful people in their staff. The facility is clean and I would recommend this facility to my family and friends. Keep up the great work.. The facility here is very nice, very clean. My unit on the second floor is very convenient, the elevators are huge and they have large carts available. Only once, the carts were all MIA. It is easy to access the facilities after hours. I like that the lights are motion-controlled, I always appreciate energy conservation. My only gripe is that when I signed up for the unit, I learned that I had to agree that they could raise their rates at any time, which they did 4-5 months after I was there. They are still pretty reasonable though. Drive south on N Cicero Ave. Turn left onto N Milwaukee Ave. Turn right onto N Kilbourn Ave. Turn left onto W Addison St. Our facility will be on the left before N Kostner Ave.
Drive north on N Cicero Ave. Pass the U.S. Post Office and continue straight. Turn right at McDonald’s onto W Addison St. Our facility will be on the right after N Kilbourn Ave.
Drive west on W Irving Park Rd. Cross North Branch Chicago River and continue straight. Turn left onto N Tripp Ave. Turn right onto W Addison St. Our facility will be on the right after N Kostner Ave.
Drive east on W Irving Park Rd. Pass the U.S. Post Office and continue straight. Turn right onto N Milwaukee Ave. Turn right onto N Kilbourn Ave. Turn left onto W Addison St. Our facility will be on the left before N Kostner Ave.